Click on the link below to print out a poster of the alphabet with both upper-case (‘big’ or capital) letters and lower-case (‘little’) letters. 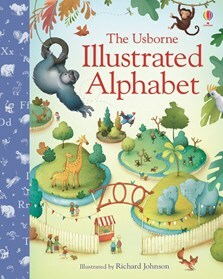 A rollicking romp through the alphabet with the animals at the zoo, and a different letter and animal on each beautifully illustrated page. With animals from furious foxes to wild wombats to help children remember letter shapes and sounds. A luxurious cloth-bound hardback book presented in a beautifully decorated slipcase, this is a wonderful gift.